This dirty URL comes via Alichia Keller. Now, I'm all for branding. But sometimes just slapping a dot-com under a logo does more harm than good. In this case the staggering lines here leave the dot-com hanging and the triangle makes you think that maybe the URL is just Clean.com. 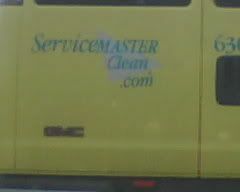 Needless to say, these guys need to clean up their URL-act.